Manager-less Chelsea meet Sunderland, while Benteke will be aiming to break his goalscoring duck. 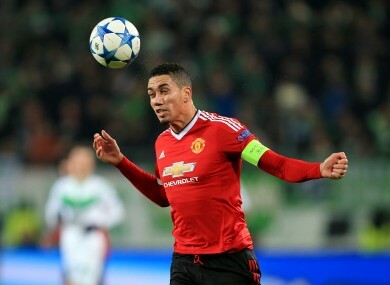 Man United's Chris Smalling has been one of the Premier League's standout defenders this season. CHELSEA’S RECENT PROBLEMS have been well documented, but Sunderland at home looks like the perfect game for them to halt their slide. The Black Cats, currently second from bottom in the league with 12 points, do not look likely to repeat their feat of winning at Stamford Bridge two seasons ago, given their form of late. Clubs who lose their manager often get a temporary boost in performance, and Chelsea will hardly even need to raise their game significantly to overcome Sam Allardyce’s beleaguered outfit. As impressive as Leicester have been of late, as evidenced by their position at the top of the Premier League, playing Everton at Goodison won’t be easy. While Claudio Ranieri’s men are unbeaten in nine matches, and haven’t lost away from home in the league for nine months, Everton are also on a decent run of form too. The Toffees are themselves unbeaten in six matches, though they haven’t beaten a team in the top half of the table in the league this season. Moreover, 13 of the sides’ 18 Premier League meetings have been drawn, and it would be no surprise if the outcome was the same on Saturday. Arsenal and Man City boast arguably the two best attacks in the Premier League, so plenty of goals will be anticipated when they meet on Monday night. Leicester aside, no side has scored more Premier League goals this season than the Gunners and the Etihad outfit. And it no surprise, given the riches at their disposal — for Arsenal, Mesut Ozil’s 13 Premier League assists are unrivalled, while Man City’s David Silva was recently named the league’s best player by Gary Neville, and the Spaniard is starting to look back to his best after a period out injured. Man United haven’t been enjoying the best of times lately, but the most positive aspect of their campaign so far has been the back four. While being without a win in their last five games, Man United have kept clean sheets in six of their last seven home league matches. Expect the Red Devils to control the play against Norwich tomorrow afternoon, though it could be a frustrating afternoon for an Old Trafford crowd that have seen just 10 league goals this season, providing the visitors pack their defence as expected. Despite the odd bad result, the signs have been largely encouraging for Liverpool under Jurgen Klopp. The Reds have earned 12 points from Klopp’s eight games at the helm thus far, though face a seemingly tricky task in overcoming seventh-placed Watford at Vicarage Road. The Anfield club demonstrated their potential in the 6-1 League Cup defeat of Southampton, and if they can reach that level, they should be good enough to beat the Hornets in Sunday’s early game. Email “Man United to keep a clean sheet and 4 other Premier League bets to consider this weekend”. Feedback on “Man United to keep a clean sheet and 4 other Premier League bets to consider this weekend”.